(Nanowerk News) For the engineers who design cell phones, solar panels and computer chips, it's increasingly important to be able to control the way heat moves through the crystalline materials — such as silicon — that these devices are based on. In computer and cell-phone chips, for example, one of the key limitations to increasing speed and memory is the need to dissipate the heat generated by the chips. To understand how heat spreads through a material, consider that heat — as well as sound — is actually the motion or vibration of atoms and molecules: Low-frequency vibrations correspond to sound, while higher frequencies correspond to heat. At each frequency, quantum mechanics principles dictate that the vibrational energy must be a multiple of a basic amount of energy, called a quantum, that is proportional to the frequency. Physicists call these basic levels of energy phonons. In a sense, then, "phonon" is just a fancy word for a particle of heat. A computer simulation shows phonons, depicted as color variations, traveling through a crystal lattice. The lattice in this case is broken up by round rods whose spacing has been chosen to block the passage of phonons of certain wavelengths. Phonons are especially relevant in the behavior of heat and sound in crystals, explains Gang Chen, the Rohsenow Professor of Mechanical Engineering at MIT. In a crystal, the atoms are neatly arranged in a uniform, repeating structure; when heated, the atoms can oscillate at specific frequencies. The bonds between the individual atoms in a crystal behave essentially like springs, Chen says. When one of the atoms gets pushed or pulled, it sets off a wave (or phonon) travelling through the crystal, just as sitting down on one edge of a trampoline can set off vibrations through the entire surface. In practice, most materials are filled with a chaotic mix of phonons that have different frequencies and are traveling in different directions, all superimposed on each other, in the same way that the seemingly chaotic movements of a choppy sea can (theoretically) be untangled to reveal a variety of superimposed waveforms of different frequencies and directions. But unlike photons (the particles that carry light or other electromagnetic radiation), which generally don't interact at all if they have different wavelengths, phonons of different wavelengths can interact and mix when they bump into each other, producing a different wavelength. This makes their behavior much more chaotic and thus difficult to predict and control. Just as photons of a given frequency can only exist at certain specific energy levels — exact multiples of the basic quanta —so, too, can phonons, Chen says. And when working on applied physics relating to the transfer of heat within solids, which is a specific focus of Chen's research, thinking in terms of phonons has proved to be especially useful. 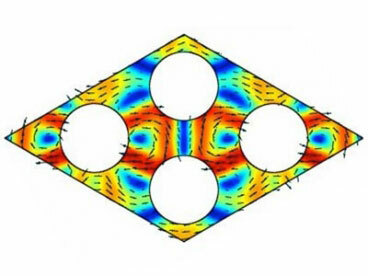 For example, in the quest for better ways to dissipate heat from computer chips — a key requirement as chips get faster and pack in more components — finding ways to manipulate the behavior of the phonons in those chips, so the heat can be removed easily, is the key. Conversely, in designing thermoelectric devices to generate electricity from temperature differences, it's important to develop materials that can conduct electricity (the motion of electrons) easily, but block the motion of phonons (that is, heat). "In some cases, you want strong conduction of phonons, and in some cases you want to reduce their propagation," Chen says. "Sometimes they're good guys, and sometimes they're bad guys."